Each time a creature is destroyed, its opponent gains 1 . Does Tolas’ constant ability trigger when it is destroyed? No. 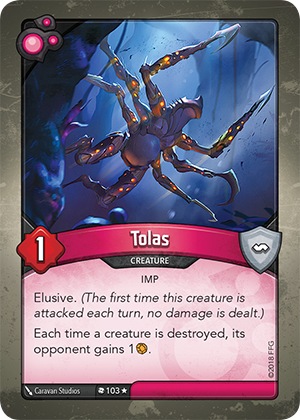 When Tolas is destroyed, his effect does not trigger because he is now out of play. Also, if Tolas is destroyed at the same time as an enemy creature, neither you or your opponent gain 1 Æmber.